Sarah, our minister, recently celebrated a ‘significant’ birthday. To mark this auspicious occasion, the pulpit was decorated with banners and a balloon. 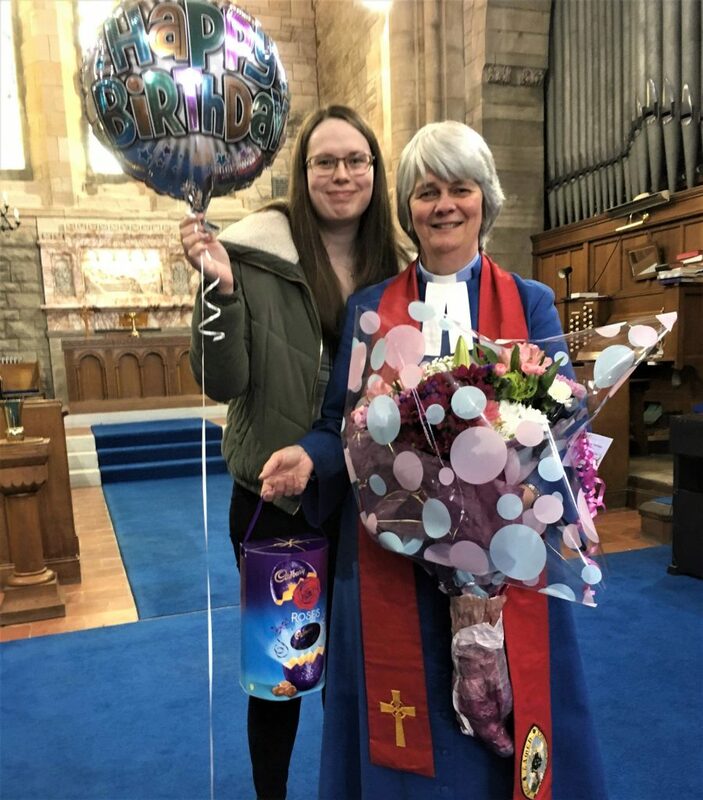 Then she was presented with flowers and an enormous chocolate egg (which we trust will be hidden away from her until after Easter because she has chosen to give up her addiction to chocolate during Lent) from the congregation with a further presentation from the Sunday School. The congregation then serenaded her with a rousing ‘Happy Birthday’. Today, the children considered the letters ‘F’ & ‘G’ as part of the Bible Alphabet exercise. They had certainly done their homework and had found Father; faith, fisherman; fish, frankincense and famine for ‘F’ with God; Goliath; Genesis, grace, gifts, Gospel, gold, Galilee; gentiles and greyhound for ‘G’. (The greyhound can be found in some versions of the King James Bible in Proverbs chapter 30, verse 31). Next week we are looking at ‘H’ & ‘I’. Mount Kilimanjaro last June. Everybody is encouraged to come along to share a fascinating recount of their adventure. You will be made very welcome, and there will be a cup of tea afterwards! The postponed Session Meeting will now take place this Thursday, 21st March at 7 pm. Volunteers to deliver Easter invitations to all homes in the parish are being sought. There is a sign-up sheet on the notice board at the end of the long corridor. They are also wanted to look after street collections for Christian Aid during Christian Aid week (12-18 May 2019). If you can help, please see Graham or Liz Sutherland. After the service next Sunday (24 March) please stay behind for the Annual Stated Meeting to review the Trustees’ Annual report and Accounts for year ending 31 December 2018. If you have any material for the April 2019 magazine, please send it to William Parker by Sunday 24 March.